written by New World aristocrat-turned-composer Hernando Franco. first recording for the Terra Nova Consort. with soothing respite in the contrasting sections by the clear and icy cool sound of the recorders. sackbuts, curtals and shawms, as well as recorders, crumhorns and vocals. With guest artist Janet Naylor on medieval harp. And founding member Amalie Sorensen on vielle. making the most of each individual melody, with harp, vielle, recorder, shawm and mezzo soprano voice. Recorded in 1993 at the Oregon Shakespeare Festival. Songs from the English Renaissance, as well as a few cherished pieces from the Odhecaton. viola da gamba and an equal balance of vocal music in polyphonic settings of secular songs. Indie label: Dorian.Released in 54 countries. Repertoire from Dorothea Schubart's complete Cancioneiro popular galego. violin, vielle, viola da gamba, shawm and recorders with a stunning percussion section and excellent vocals ! The Terra Nova Consort: Baylado! Music of Renaissance Spain. Music from the Romance and Cancioneiro Repertoires of the Spanish Renaissance. in upstate New York. The arrangements are fiery and percussive, and draw heavily on the simple music of the countryside. Renaissance Music of France, drawing on the works of Jean-Baptiste Besard, c. 1567-1617.
and lyric baritone Nicholas Tennant. Music by England's most important late 16th Century secular composer. Festival in 2006, and recorded live. © pat o'scannell, recording engineer Tom Frederick. Lutenist David Rogers featured, with mezzo soprano Pat O'Scannell on vocals, recorders and viola da gamba. Robert Dubow on violin, and Nicholas Tennant, lyric baritone. Pat O'Scannell Music Director and Arranger with the Terra Nova Consort and guest artists. Recorded in 2006 at the Oregon Shakespeare Festival. 2006 © pat o'scannell, recording engineer Tom Frederick. Soaring melodies and exquisite lyricism within simple monophonic songs of Northern Spain. An Cailin Gaelach, Traditional Songs in the Irish Language. Pat O'Scannell, singer, music director and arranger. Sue Carney on bodhran and harmonium. Recorded by Carney, mastered and edited by Mark Johnson of BLUEJAY Productions. O'Scannell on bones and Carney on bodhran will keep your legs bouncing to the beat! Kevin Carr, Barbara Mendelsohn and Pat O'Scannell, recorded by Stephen Gagne. Tomaseen Foley's first play, produced at the Oregon Cabaret Theatre. and Michael Beglan of Dublin and Cavan counties Ireland, respectively. 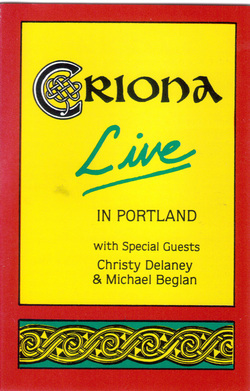 An exciting live concert recording from the Portland Northwest Service Center in 1989.
traditional Irish music an song. A tour de force! The program featured live on stage step dancing ! music on whistles, guitar, bodhran, bones and a variety of songs. Pat O'Scannell and Sue Carney co-produced and appear on this recording. A charming first recording by two of Ashland's most accomplished traditional players.